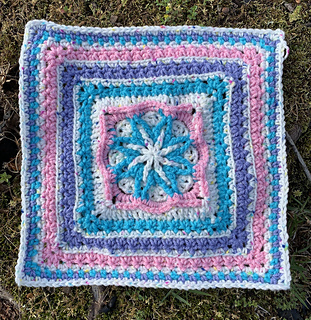 This square is the sixth in a series of afghan squares named after each of Blair Braverman’s sled dogs. Goofball Wickson was a yearling when he first ran the Iditarod in March 2019, turning 2 years old a week after they finished the race. He was the youngest member on the team but he did great! Blair is an amazing storyteller and she describes each of the dogs’ unique personalities with humor and grace. She and her husband, Quince Mountain, inspire us everyday to face our challenges (whatever they may be) with courage, humility, determination and humor. 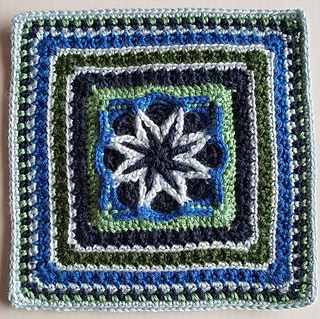 The gauge does not matter for this square. The finished size will depend on the weight of yarn and size hook used. 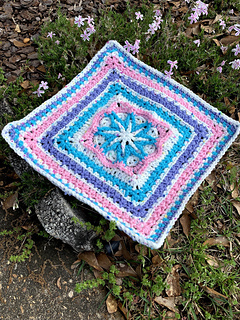 If you use worsted weight yarn and a 5.0 mm hook, the finished size should be 12” or 30 cm. Blair has given me permission to use her photos of Wickson in the pattern.